Thomas Hill was born in England on September 11, 1829. In 1844 at the age of 15, his parents brought him to the United States, where they settled in Taunton, MA. Nearby, in Boston, the young immigrant earned a living as a carriage painter and shortly after, apprenticed at an interior-decorating firm. By 1851, he had married Charlotte Elizabeth Hawkins and had fathered their first of nine children. In their early years of marriage, the young couple encountered struggles with finances and a tragedy when twins died in infancy. Amidst family hardship and at the matured age of 24, Hill made a drastic career move by deciding to enroll in art school. He attended evening classes at the Pennsylvania Academy of Design (PAFA) and studied under American painter Peter Frederick Rothermel (1812-1895). During his years as a student, Hill made the first of numerous trips to the White Mountains in New Hampshire and sketched alongside members of the Hudson River School, such as Benjamin Champney (1817-1907). In 1856, Hill and his growing family returned to Massachusetts, where he opened his first studio in Boston. After several unsuccessful attempts to sell his paintings, Hill abandoned his career as an artist and briefly returned to the furniture decoration business. However, in response to a growing financial burden, Hill and his family ventured West in search for a better climate and economic prosperity. Once in California, Hill became known for his landscape paintings of the America West. The year of 1865 marked a monumental date in Hill’s career as an artist. Along with painter Virgil Williams and photographer Carleton Watkins (1829-1916), Hill made his first of many trips to Yosemite Valley. By the end of that same year, Hill gained success and a steady patronage for his landscapes of Yosemite Valley. In 1866, Hill traveled to the East Coast and Europe. During his stay abroad, he continued to explore California themes in his paintings. A year later, Hill and his family returned to Boston, where he exhibited the monumental-sized Yosemite Valley. Three years later, he completed his second Yosemite monumental, Great Canon of the Sierra, Yosemite. During his protracted stay in the East, the artist made sketching trips to the West Coast and attended meetings of the newly established San Francisco Art Association (SFAA). By 1873, Hill once again settled in San Francisco, where he was appointed to the Committee on the School of Design of the SFAA. Over the next several years, Hill made yearly sketching trips to Yosemite, Mount Shasta, and the White Mountains to gain fresh material for his paintings. 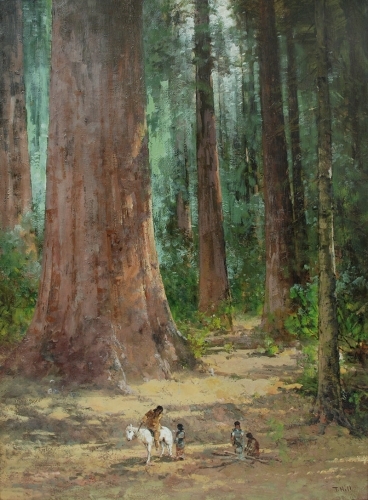 By 1876, Hill had established financial stability in San Francisco and had purchased an art gallery, where he sold prints, chromolithographs, and art supplies. In 1877, the art economy in California hit a major low. In the remaining years of his life, Hill held several auctions of his works, which proved to be unsuccessful. Fortunately, Hill's previous ventures in the stock market provided a much-needed relief for his large family and allowed him to continue painting without the primary concern of creating sellable works. Upon the death of his friend Virgil Williams, Hill briefly acted as the interim director for the SFAA School of Design. However, he soon left for Alaska on a commission for environmentalist John Muir. By late 1879, Hill retreated to his new home in Oakland and largely withdrew from the San Francisco art community. The aging artist was becoming increasingly reserved, and his monumental history painting The Last Spike was considered to be out of fashion. Moreover, his marriage, which was struggling for many years, dissolved in the early 1880’s. In his last years, he maintained a studio at Yosemite’s Wawona Hotel. The familiar Yosemite landscape was a haven for the aging Hill, and he often entertained tourists, including President Theodore Roosevelt. After suffering from a stroke, Hill traveled up and down the California Coast, making stops in Coronado, San Diego and Santa Barbara in search of a more agreeable climate. He died in Raymond, CA on June 30, 1908. Some artists are artists by blood or artists by extensive practice; Thomas Hill was an artist of a different brand. He was driven by a vision derived from his firsthand experience of nature. Early on his life, he did not have a dream to become an artist, and he only briefly studied at a formal art institution. For Thomas Hill, Yosemite Valley and the White Mountains of New Hampshire were his classrooms, and the awe-inspiring beauty of the American wilderness was his source of inspiration. 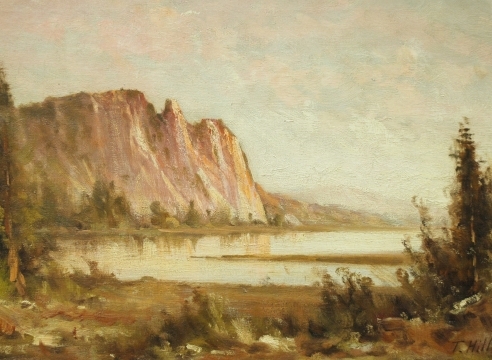 Almost no early paintings by Hill exist today; however, it has been noted that Hill began to visit the White Mountains in the summer of 1854. His association with the Hudson River School has largely stemmed from his frequent trips to the White Mountains with artist friend Benjamin Champney. Like many of the Hudson River School, Hill valued the practice of painting en plein-air, and created thousands of oil sketches in his lifetime. In a recent monograph on the artist, art historian Janice T. Driesbach argues that the oil sketches Thomas Hill produced en plein air are the foundation for some of the artist’s larger known paintings and are in themselves some of his greatest accomplishments. In 1858, Hill exhibited 30 paintings in Boston, which were advertised as “carefully finished from sketches.” As Driesbach has noted, this is the first sign that Hill’s works were based on his oil sketches. Throughout Hill’s career, exploration was as large a part of his success as were his truthful sketches. 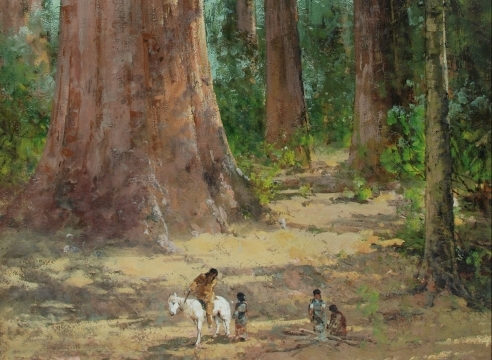 Hill’s move to California in 1861 allowed him to explore new geographic regions to draw material from for his paintings. 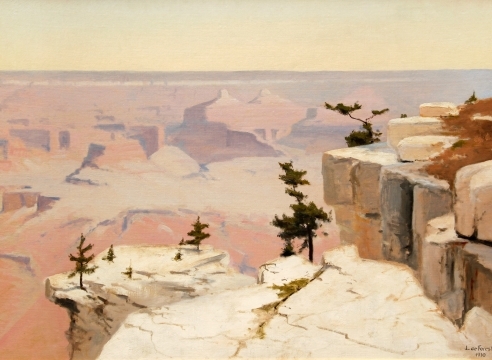 He chose many monumental vistas, like the Yosemite, the Yellowstone, and other larger than life physical monuments as the basis of his paintings. His works from this point forward are occupied with scenes of the California landscape, including Napa Valley, the Russian River, Lake Tahoe and most notoriously, Yosemite Valley. Even when visiting Europe, Hill could not shake the effect Yosemite had on him and some of his greatest landscapes of Yosemite were completed while abroad. During his lifetime, Hill’s paintings were a huge success in late 19th-century California, and they often garnered a price tag of $10,000. Appropriately, many of San Francisco’s millionaires of the period were patrons of his, including business and railroad tycoons E.B. Crocker, William Ralston, William Sharon, D.O. Mills and Leland Stanford. He was often favorably compared to the older generation of American landscape painters, including Albert Bierstadt, who pioneered monumental Yosemite Valley paintings. 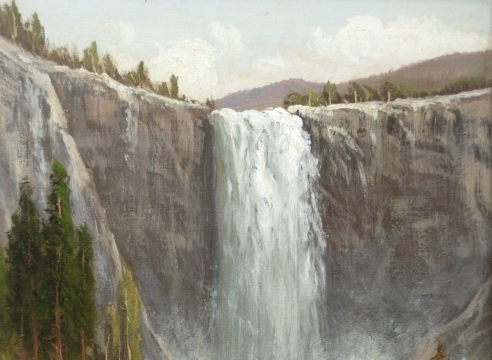 Today, Hill’s own Yosemite Valley paintings remain as his most popular works and are legendary for their stunning representations of the region. 1878 Travels to Oregon and Washington Territory. 1885 Daughter Estella marries John Washburn. Hill begins his long stays at Washburn’s Yosemite hotel the Wawona. 1886 Hill serves as interim Director of School of Design. Holds fourth auction. 1. 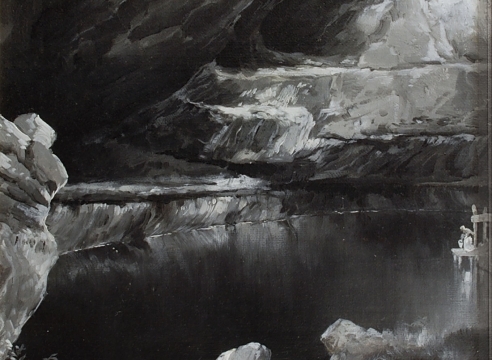 Driesbach, Janice T. Direct from Nature: the Oil Sketches of Thomas Hill. Sacramento, CA: Crocker Art Museum, 1997. 2. Falk, Peter Hastings ed. Who Was Who in American Art: 1564-1975. Vol. II. Madison, CT: Sound View Press, 1999. 3. Fielding, Mantle. Dictionary of American Painters, Sculptures & Engravers. Green Farms, Ct: Modern Books and Crafts, 1974. 4. Hughes, Edan Milton. Artists in California: 1786-1940. Third ed. Sacramento, Calif.: Crocker Art Museum, 2002.